In the interview, which was conducted by fans who had been critical of the team and were invited to Maranello, Domenicali also addressed the issues of Alonso’s recent criticism of the team that earned a rebuke from Ferrari president Luca di Montezemolo. Domenicali, who was asked why he did not also dress down Alonso in public, said: “If I have something to say to him, as would be the case with my engineers, I would do it behind closed doors and in a harsh manner. “In Formula One, now is the time to go back to victory, because I am a little pissed off to arrive second for four years,” di Montezemolo tells me in a hushed yet purposeful tone, stopping short of throwing his fist down on the sofa. Memo to Alonso and Massa – it probably wouldn’t be sensible to surrender the current second place in the this year’s constructors’ championship. But regardless of what happens this year, di Montezemolo is clearly expecting great things following the news that Kimi Räikkönen will return to Ferrari in 2014. The Ice Man cometh, and di Montezemolo will be greeting him with all the warmth of a long-lost friend. Kimi is – after all – the last driver to win the Formula One world championship for Ferrari. 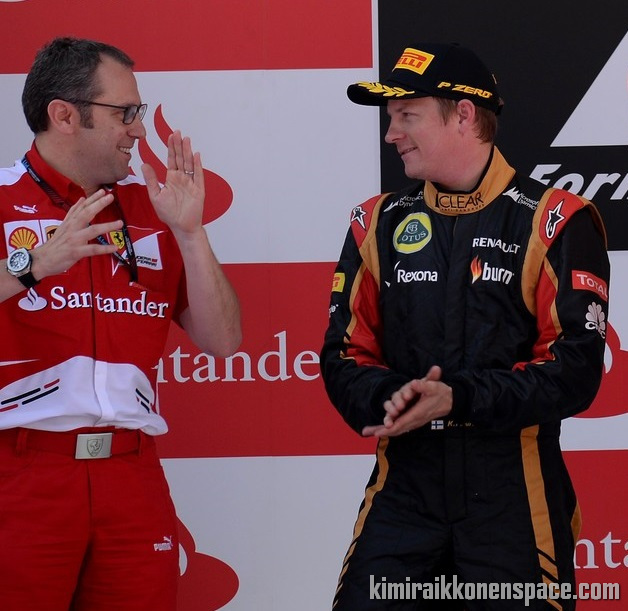 A parting swipe at the departing Felipe Massa or a just an indication of what di Montezemolo expects from Räikkönen? You decide. But whatever, it’s clear that the recent lack of success at Ferrari hits the good people of Maranello hard. In 2014, Ferrari will be driven not just by hope, but by huge expectation.